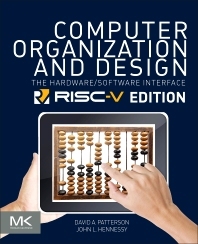 The new RISC-V Edition of Computer Organization and Design features the RISC-V open source instruction set architecture, the first open source architecture designed to be used in modern computing environments such as cloud computing, mobile devices, and other embedded systems. With the post-PC era now upon us, Computer Organization and Design moves forward to explore this generational change with examples, exercises, and material highlighting the emergence of mobile computing and the Cloud. Updated content featuring tablet computers, Cloud infrastructure, and the x86 (cloud computing) and ARM (mobile computing devices) architectures is included. Computer Organization and Design RISC-V Edition? David Patterson is the Pardee Professor of Computer Science, Emeritus at the University of California at Berkeley, which he joined after graduating from UCLA in 1977.His teaching has been honored by the Distinguished Teaching Award from the University of California, the Karlstrom Award from ACM, and the Mulligan Education Medal and Undergraduate Teaching Award from IEEE. Prof. Patterson received the IEEE Technical Achievement Award and the ACM Eckert-Mauchly Award for contributions to RISC, and he shared the IEEE Johnson Information Storage Award for contributions to RAID. He also shared the IEEE John von Neumann Medal and the C & C Prize with John Hennessy. Like his co-author, Prof. Patterson is a Fellow of the American Academy of Arts and Sciences, the Computer History Museum, ACM, and IEEE, and he was elected to the National Academy of Engineering, the National Academy of Sciences, and the Silicon Valley Engineering Hall of Fame. He served on the Information Technology Advisory Committee to the U.S. President, as chair of the CS division in the Berkeley EECS department, as chair of the Computing Research Association, and as President of ACM. This record led to Distinguished Service Awards from ACM, CRA, and SIGARCH.